It's Saturday, which means it's time for a new challenge at Dynamic Duos! It's DD #61. This weeks colors are so soft and pretty. See? I decided to pull out a stamp set that I haven't used in a long time. It's Sew Lovely, from Lawn Fawn. I did some paper piecing on the dress and dress form. I find fussy cutting to be so calming. 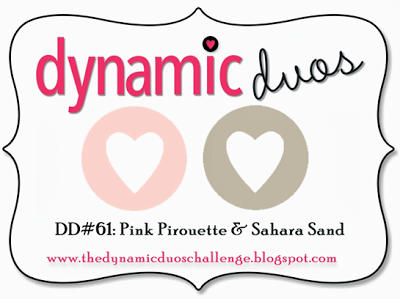 I hope you'll play along with me and the rest of the Design Team at Dynamic Duos this week. We LOVE to see what you create! Oh Susie, this card is adorable!! Love that dress and all that bling is PERFECT! WTG! Susie this is fabulous, I don't think I have seen this LF set, off to look for it. Your card is gorgeous! Just gorgeous, Susie! Love that dress form and beautiful touch with the bling! Hope you're having a wonderful weekend, hugs! The bling is perfect with that stamp! This card is so pretty Susie, loving the bling!